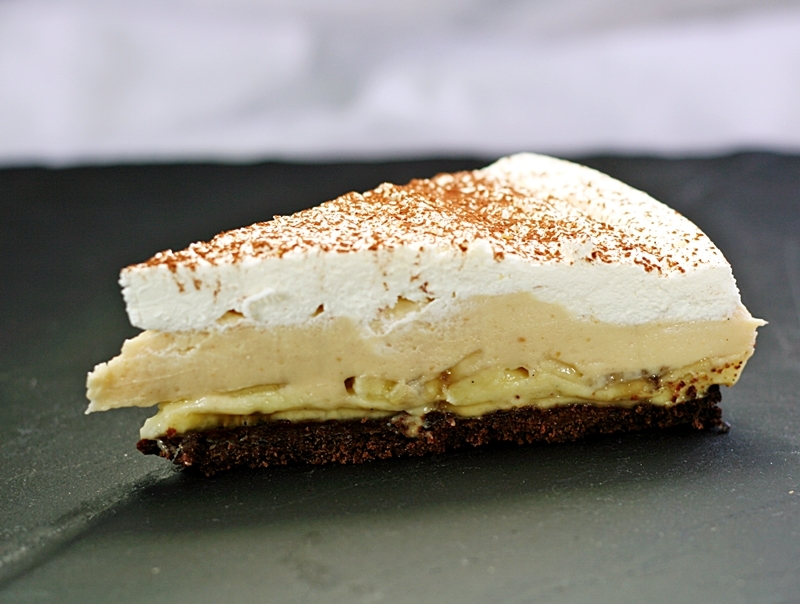 Here’s a little something that popped into my head trying to combine a childhood favourite (banana custard) with an all-American classic (banana cream pie). Instead of using custard powder from a tin, I wanted to make proper, egg-yolk custard with a vanilla bean for flavouring. Whilst scanning the recipes on Tastespotting I noticed several recipes included peanut butter as an additional flavouring. Others had used chocolate. I thought: bananas, peanut butter, chocolate, custard – what’s not to like? Why not pile all four together into one glorious, outrageously decadent dessert? Let us pause here for a confession – I find that all the huge, towering and generally overblown portions seen on many American food shows make me slightly unwell: it’s just too much food. If it tastes good, why does it have to be stacked 20-25cm high? Do 30 slices of brisket taste any better than two slices? The desserts are frequently the same. It really doesn’t make my mouth water to see a whole mountain of cream and cake and custard and toppings and goo and anything else that can be thrown at a dessert poised precariously on a woefully inadequate plate. Don’t get me wrong, I LOVE watching American cooking shows. For a long time I was a great Man v Food fan, although the pig-out ‘challenges’ I found a bit gross. Now I’ve moved on to Guy Fieri’s Diners, Drive-Ins and Dives. He shows some delicious food, and best of all, you see the restaurant owners making some of their best sellers, and the recipes are usually available on the food network website. There’s lots that I would like to try, but I’d make them in normal, regular-sized portions rather than the vast quantities shown on the show. So with this dessert, I wanted great flavours, but in a restrained quantity. The slice in the photograph is just 4cm high, and 10cm long. For all it’s petite dimensions, it tasted amazing. I had to send the rest with my husband to his work, otherwise the temptation might have been too great. I talked about this a bit on Twitter, but for those that missed it, the rundown of the layers, starting at the bottom, is: chocolate crust, banana slices, vanilla crème patissière, banana slices, peanut butter cheesecake, double cream, cocoa. I’ve tried this layering both ways – custard on the bottom & custard on the top, and I think it actually works better from a texture perspective, with the custard layer on the top, which is not how the slice in the photo was done, but it’s entirely up to you which way round you layer it. Apart from being OMG AMAZING, this dessert is great because you can make everything separately and then just assemble it when convenient. Having said that, I found it was better if the custard was poured when warm, but you can use it cold just fine. This is very much a Lego dessert – I’ve taken recipes for each element from here and there and clicked them together to make something delicious. The chocolate crust is actually the scaled down recipe from the Midnight Meringue. I halved and tweaked a Raymond Blanc recipe for crème patissière and adapted the peanut butter layer from a pie recipe I found on the web. I hope you enjoy the flavours enough to give this recipe a try, because together they are fabulous. Preheat the oven to 200°C 180°C Fan. Grease and line with parchment a loose-bottomed, 20cm tart tin. In a food processor, mix flour, cocoa and sugar. Add butter, cut in small cubes. Blitz. Add the tablespoon of milk and blend again until mixture resembles coarse, damp sand. Press the mixture into the base of your pie tin. If you’ve got extra pastry left over, you could press it into the sides to make a full tart shell. Line with baking parchment, fill with rice/beans/baking beads and bake blind for 10 minutes. Remove beans and parchment and return to the oven until fully baked (8-10 minutes). Allow the pastry to cool in the tin on a wire rack. Split the vanilla pod and scrape out the seeds. Put the seeds into a bowl with the yolks and sugar. Put the pod into a small saucepan with the milk and put it over the lowest possible heat to infuse. Whisk together the vanilla seeds, yolks and sugar until they are pale and creamy. Whisk in the flour and cornflour and set aside. Bring the milk to a boil and strain it through a fine sieve to remove the vanilla pod. Whilst whisking, pour the hot milk down the side of the bowl onto the egg mixture. Make sure , whisking all the time, then return the mixture to the pan. Keep whisking the mixture over a low heat until it thickens. Pour the thickened custard into a bowl and lay cling film onto the surface to prevent a skin forming. Whisk the cream cheese until smooth. Add the sugar and whisk to incorporate. Add the peanut butter and mix thoroughly. Add the double cream and mix thoroughly. Set aside. This is more of a suggestion than hard and fast rules. Order the layers how you like. If you have some food-grade acetate, use it to line the edge of the tin – it will make for a cleaner edge to the dessert when you slide it out. Slice one of the bananas extremely thinly and lay the slices in a layer on top of the chocolate crust. Select your next layer – peanut butter or custard. Spoon the mixture into a piping bag fitted with a plain nozzle and pipe the filling over the banana slices. You don’t HAVE to do this, but just spreading with a spoon tends to make the banana slices lift up and move out of place. Make sure the banana slices are completely covered – this will help to slow down the browning of the banana. Slice the second banana thinly and place in a layer over the piped filling. Put your second layer into the piping bag and pipe over the second banana layer. Again, make sure the banana slices are completely covered. Whip the double cream to soft peaks and spread lightly over the op of the dessert. Sprinkle cocoa over the whipped cream. Cover lightly with cling film and chill until required.